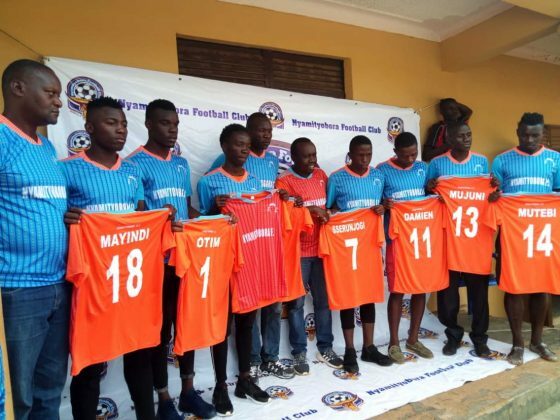 MBARARA – Nyamityobora football club have bolstered their squad with 8 new signings ahead of the second round of the StarTimes Uganda Premier League. The Mbarara club officially unveiled the new players to the fans and the media at their training ground at Kijungu in Mbarara. The new players are Denis Otim, Joel Ayoku, Edgar Mujuni, John Sserunjogi, Damien Nakalema, Fred Mayindi Junior, James Tongi and Peter Mutebi. Otim is a goalkeeper on the Uganda national U-20 team the Hippos and has been handed shirt number 1 on arrival from Mbarara FC. He will vie for the club’s gloves with Hillary Jomi who has been the Abanyakare’s stand out performer in the first round. Ayoku who has been acquired from Doves All Stars, took up shirt number 2 previously occupied by departed club captain Henry Wamala. He is a defender by trade. Defensive midfielder Mayindi will don shirt number 18 after switching from regional league club Riverside Forest Park Sporting Club. Former Agape Lions left back Mujuni will put on number 13 while offensive midfielder Damien Nakalema from Big League side Water FC has been given number 11. Former Express and Proline offensive midfielder Peter Mutebi who was earlier signed from Rushere FC was handed number 14 while John Sserunjogi “Muchaina” took up number 7 previously occupied by Charles Sebutinde in the first round. Sserunjogi is a diminutive winger signed from Kikyusa Cream FC, a Luwero based club which formerly competed in the Buganda Regional League. James Tongoi a midfielder from Kampala regional league outfit Bweyogerere Football Club is the club’s eighth signing. The new recruits are expected to debut in the club’s subsequent league fixture against Police FC at Lugogo on Tuesday 29th January. The Banyakare have had their first half of the season in the top flight a bitter story to tell but hope to beat the drop under the tutelage of Asaph Mwebaze. Nyamityobora are third from the bottom on the 16-team log having managed only two wins, 3 draws and succumbed to 10 defeats.